BRIDGETOWN, Barbados – Leon Johnson led from the front with a composed, maiden List “A” hundred, but Guyana Jaguars required frantic, last-over heroics from Veerasammy Permaul to inch to a one-wicket victory over Jamaica Scorpions to qualify for the Grand Final of the 2018-19 Super50 Cup on Thursday here. Johnson, the Jaguars captain, gathered 101 from 136 balls and shared 130 for the fourth wicket with fellow left-hander, Barbados-born all-rounder Raymon Reifer to get their side’s chase of 273 for victory back on track in the first semi-final played under the lights at Kensington Oval. The two WINDIES internationals revived the Jags from 70 for three in the 12th over, but Johnson was caught behind off his opposite number, veteran left-arm spinner Nikita Miller in the 40th over with 73 required. The tension continued to rise, when Reifer, whose 68 from 81 balls included two fours and one six, was needlessly run out in the 46th over with 32 needed from the final 26 deliveries. Permaul replaced him and put on a vital 22 for the eighth wicket with left-hander Ricardo Adams, whose six over wide long-on off the last ball of the 48th over – bowled by Gordon Bryan – tipped the scales, before he too, was run out to leave the Jaguars needing 10 from the last eight balls. Veteran Jermaine Taylor, whose 3-44 from 10 overs made him the most successful Scorpions bowler, delved into his vast experience and conceded just four from the penultimate over, leaving the Jags to get nine from the final over. Miller entrusted the final six balls to Bryan and got the wicket of Clinton Pestano, caught inside the long-on boundary off the first ball to further raise the intrigue. But the diminutive Permaul, having gained strike when the batsmen crossed while running between the wickets during the dismissal, burst the Scorpions’ balloon when he swatted the next delivery from Bryan over wide long-on for six. Permaul scrambled a single and a leg-bye from the next two deliveries in the company of last man, Jamaica-born, former WINDIES Under-19 captain Ramaal Lewis before he drove Bryan through cover for four to seal the victory with one ball remaining. The Jaguars now await the outcome of Friday’s second semi-final at Kensington Oval between Combined Campuses & Colleges Marooners and the star-studded Trinidad & Tobago Red Force to know their opponents in the Grand Final which will be contested on Sunday at the same venue. Earlier, half-centuries from Nkrumah Bonner and John Campbell propped up the Scorpions’ batting, as they posted 272 for eight from their allocation of 50 overs, after they won the toss. 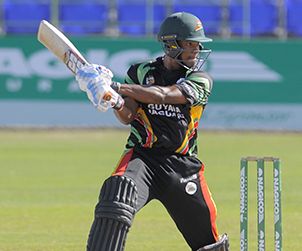 Campbell gave the Scorpions’ innings early momentum with a typically enterprising 56 from 59 balls that included six fours and one six. But Bonner led a rear-guard with an unbeaten, top score of 76 from 64 balls that included five fours and one six, after the Scorpions stumbled to 135 for five in the 31st over. He shared 69 for the sixth wicket with Derval Green and helped the Scorpions raise 80 in the last 10 overs before Johnson, Reifer and later Permaul rendered his efforts inadequate. Pestano was the most successful Jaguars bowler with 3-56 from 10 overs.